Joe Bernick is organizational secretary of the Communist Party USA for Arizona, a post he has held since 1984.. He has been Director Salt of the Earth Labor College since 1996. – Present (16 years). Joe Bernick, the longtime director of the Salt of the Earth Labor College. Born in Minnesota, Joe spent most of his childhood in the recently-occupied Palestine, returning to Minnesota in the early 1960s to finish high school. He became active in the civil rights, peace and Palestine justice movement, and worked in Minneapolis factories, where he was active in the Iron Workers and Teamsters unions. Joe Bernick, persuaded Moorhead State College in Minnesota to recognize a Students for a Democratic Society chapter on the campus, 1966. In April, 1966 -- After much debate, SDS is granted a charter as a student organization. February, 1968 -- Political and social difference emerge during the Student Senate elections; one candidate denies having suggested that "John Neumaier and [Joe] Bernick are members of a subversive Jewish organization," or saying that Bernick "hates all Christians." Bernick is defeated in the subsequent election. Bernick later served in the Student Senate and stirred controversy as editor of the Mistic newspaper from 1968. 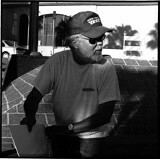 One of the signatories was Joe Bernick..
Joe Bernick, Homeless Coalition, Tucson, was one of those listed. Bernick of Jobs with Justice and Tucson, Arizona was on the list. Joe Bernick, active in the peace movement since 1964, grew up in the Middle East and has traveled to Israel, Jordan, Egypt, Turkey and Tunisia. He is involved in the Arizona Peace Council, Tucson Peace Action Community, the Tucson Peace Center and Salt of the Earth Labor College. Key attendess included Salvador Barajas, Sunnyside School Board Member Magdalena Barajas, Rolande Baker, Joe Bernick, Mary Carmen Donaldson, Hon. Dan Eckstrom, County Supervisor Richard Elias, Tucson City Council Member Richard Fimbres, TUSD Board Member Adelita Grijalva, James Hannley, Rigoberto Lopez, Raul Nido, Laura Portillo, Manuel E. Portillo, Tucson City Council Member Regina Romero, Albert Siqueiros, Janet L. Valencia and Steve Valencia. Baker, Bernick, Hannley and both Valencias were all affiliated with the Arizona District Communist Party USA. March 22nd, HOW ABOUT A SOCIALIST USA? , Workshop/Panel with local activists Carolyn Trowbridge, Joe Bernick, and Dereka Rushbrook. This page was last modified on 13 September 2018, at 19:01.